What Canadian kid has not yelled out "I'm Wayne Gretzky" while forming up for a good old fashioned game of road hockey? There is no question that as the 1970s turned into the 80s, then for much of the next 30 years, the name of the Great One would be the most coveted on ice covered ponds, slippery side streets and in small town rinks from coast to coast and throughout the U.S.
As a longtime Habs fan I would more likely have been heard to utter names like Lafleur, Beliveau, Richard, Lemaire, or Dryden and Hainsworth if I happened to be in goal. Despite how unsporty I am now, as a young person I spent hours and hours on Second Street in Kamsack playing road hockey. 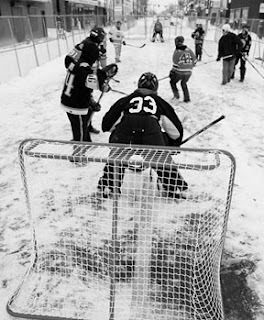 Even if it was bitter cold, we'd pull on our snowsuits and batter around the frozen tennis ball or soft rubber puck long past the sun going down. The names of the players drift through my mind, friends from my youth: Freddie, Gordie, Ron, Jeff, Craig, Delton, and so many more. 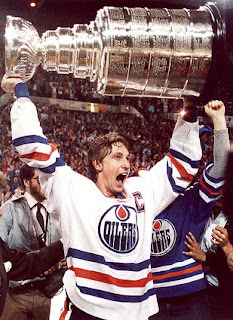 In those years, Gretzky was tearing up the record books and catapulting the Edmonton Oilers to the unstoppable champions that they became, dominating the decade. The odd guy would lay claim to having his rookie card, though I don't recall actually seeing one. 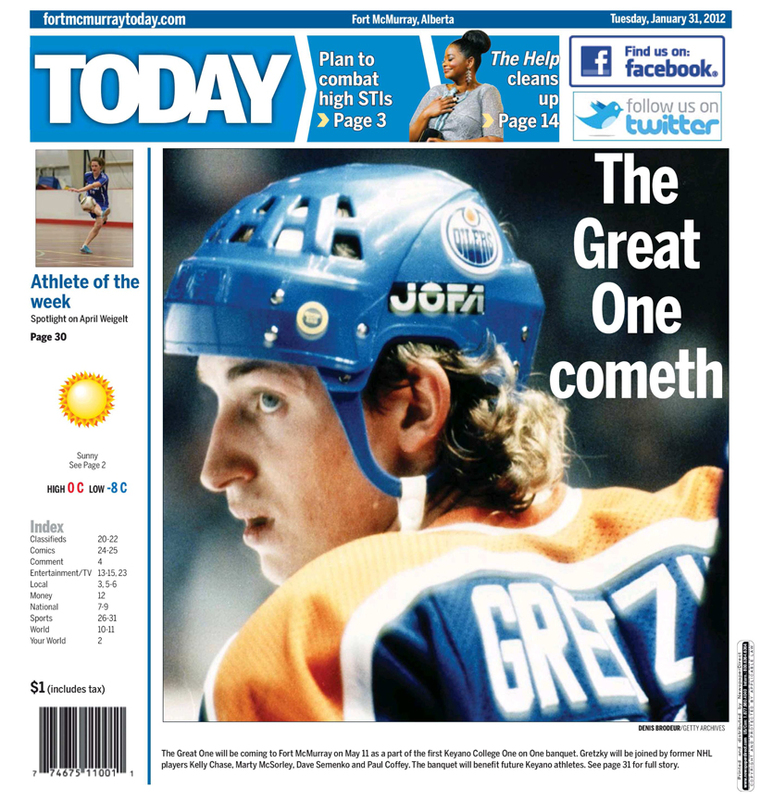 Everyone would sing his praises, even those who bitterly detested the Oilers from the province across the border. Apparently, Wayne never had the occasion to travel to Fort McMurray, despite all his years in Alberta. 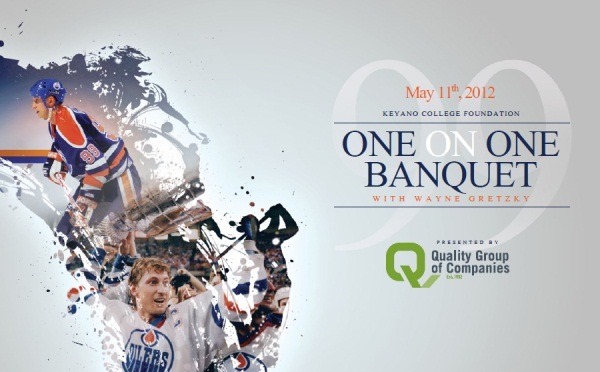 On May 11th, that is going to change forever as the greatest hockey player in the history of the game comes to Keyano College for the annual One on One Banquet, presented by our friends at The Quality Group of Companies. In terms of sports news, it doesn't get any better or bigger. This is front page stuff. 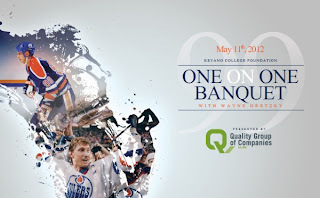 A fundraising event in support of the Keyano Huskies Endowment, the One on One Banquet really represents the future. From multiple sectors I've heard a growing desire to give our young athletes better resources, training, and access to facilities so they can compete on a global level. I'm proud of the role that Keyano is playing in sport development, through the Syncrude Sport & Wellness Centre, Alberta Sport Development Centre Northeast, and Huskies Athletics. The seeds of this event were sown by One on One Banquet committee Chair Shawn Chaulk, the owner of the worlds largest collection of Wayne Gretzky memorabilia. Also President of Stratford Contracting, Shawn is a member of the Keyano College Foundation board of directors. 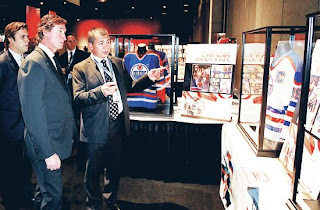 He was down in Edmonton last year sharing his collection at a major fundraising event for the Kinsmen. Number 99 was there and started asking lots of questions about what was happening in Fort McMurray, about our economy and industry. That curiosity led to the natural query of why not doing a similar type of fundraising event back home. The rest is history. When you think about the impact that this one man has had on the game of hockey, on our province, on the reputation of our country around the world, it is staggering. That he will walk through the double doors at the Syncrude Sport & Wellness Centre at Keyano College and interact with 550 of our guests on May 11th - absolutely priceless. Awesome news! I am SO there!